This site is for students in the Global Hunt for Civic Intelligence program for 12 credits, for students who are registered for the Undergraduate Research in Civic Intelligence, and anybody who’s interested in collaborative, student-led, project work. See How Civic Intelligence Can Teach What it Means to be a Citizen for an op-ed on CIRAL and Civic Intelligence in education. 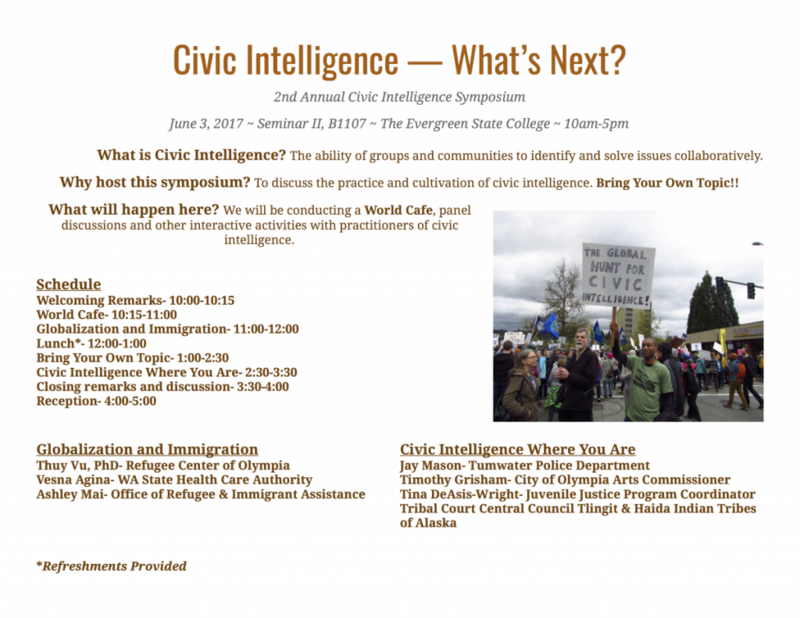 The goal of the CIRAL is to create a sustaining enterprise at Evergreen (whether it be through programs, classes, organizations, research options, internships, contracts, or some combination) that engages in research and action through a focus on civic intelligence. Due to the nature of this focus students will necessarily become active leaders. The enterprise will encourage and teach social action for the betterment of not just our community, but those around the world. The work will not be restricted to working with local organizations, but — at least at the onset — there will probably be a focus on the local community. The hope is that CIRAL, which was initiated in the fall of 2011, will persist over time, perhaps somewhere between 5-10 years, although the ideal is an indefinite end. The Evergreen State College is a progressive, experimental college in the Pacific Northwest. It strives to integrate theory and practice and to a large degree student-directed learning. Through its interdisciplinary programs and independent learning contracts — and its narrative approach to evaluation (no grades) and absence of required classes Evergreen stands nearly alone in terms of not embracing the standard format while not reducing disciplined thinking and learning. Evergreen has been remarkably successful in student engagement as well as in the percentage of students who find employment after leaving Evergreen.